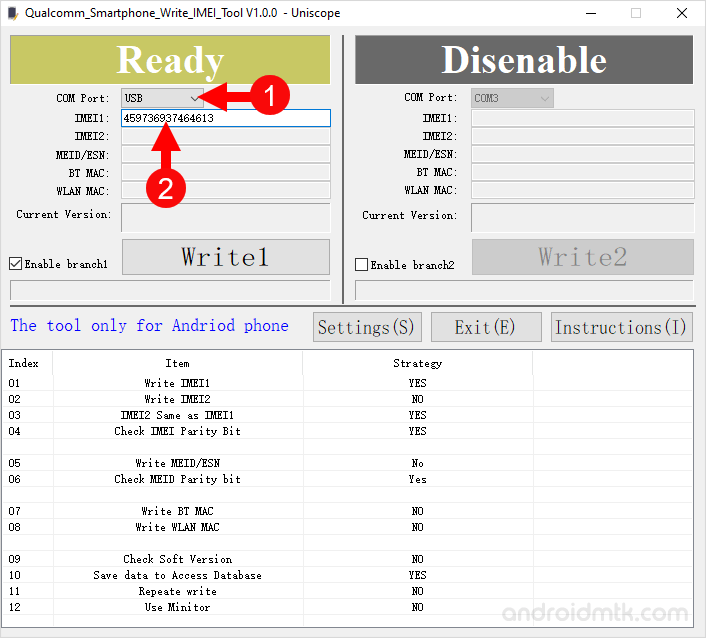 These are the instructions to flash IMEI on Qualcomm Smartphone and Tablets using the Qualcomm Smartphone Write IMEI Tool on Windows Computer. Requirements: You need to have a Qualcomm Chipset based Smartphone or tablets. 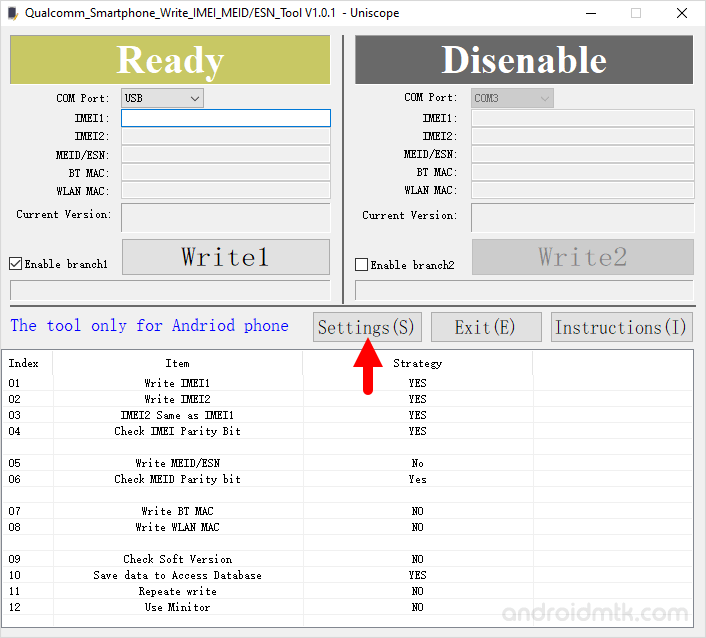 If in case your device is running on any other chipset then the following tutorial will not work for you. Step 1: Download and install Uniscope Qualcomm Driver on your Computer. If in case you have already installed the Uniscope Qualcomm driver on your computer then SKIP this step. 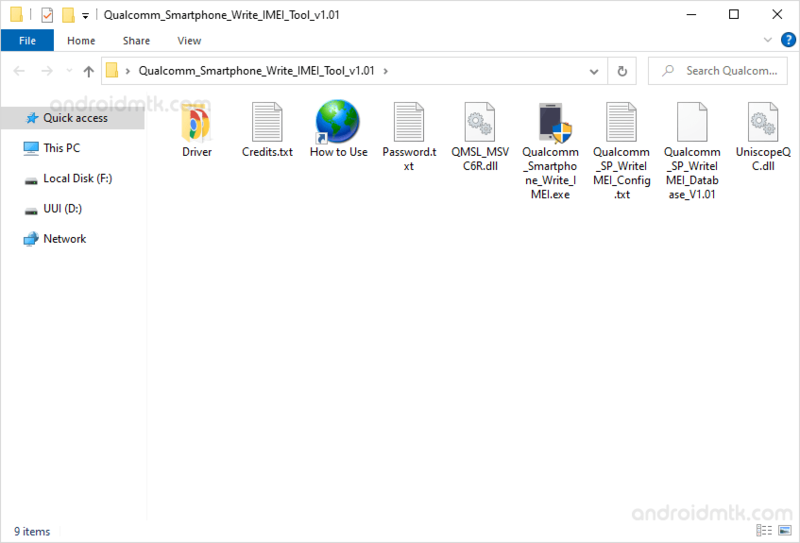 Step 3: Now, Open Qualcomm_Smartphone_Write_IMEI.exe. Step 5: Now, Click on the Settings button and enter ustest to Login. Step 6: Now, in the Settings Dialog box, you will see several options. 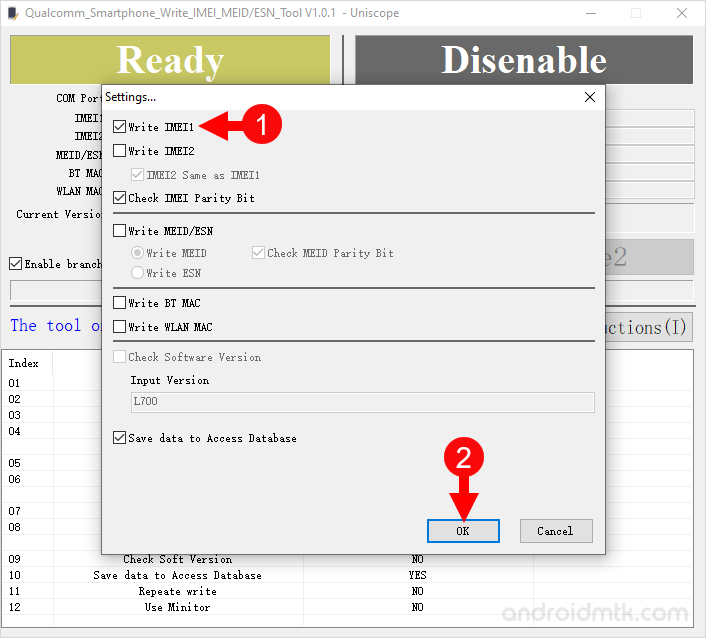 Select Write IMEI1 (if you have dual SIM device then also select Write2 option) and click on OK button. Step 7: Now, Select the COM Port as USB and Enter the IMEI into the input box. Step 8: Now, Restart your Device and Connect it to the computer using the USB Cable. Step 9: Now, Click on the Write1 Button to begin the Writing Process. Step 10: Once, Writing process is completed, you will be able to see Green Pass Box on the screen. Step 11: Now, Disconnect your device from the computer and restart it again. Step 12: Now, Check the IMEI of your device by dialing *#06# to check the IMEI. If you are able to see the same IMEI on your device then the process was successful. 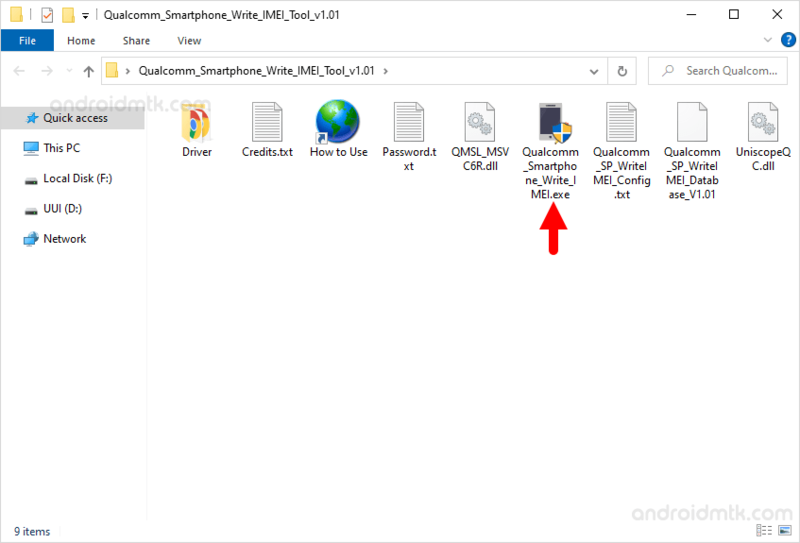 So, congrats, you Just learned to flash IMEI on any Qualcomm device. [*] Supported Platforms: It supports Qualcomm MSM8916, MSM8909, MSM8939, MSM8209 and MSM8592 platforms. It may not work on other platforms, as it is designed to work on the devices running on Qualcomm Chipsets. [*] Caution: Writing IMEI other than the Original is illegal in many countries. So, we recommend you to flash the original IMEI only, or else it may cause serious trouble to you. 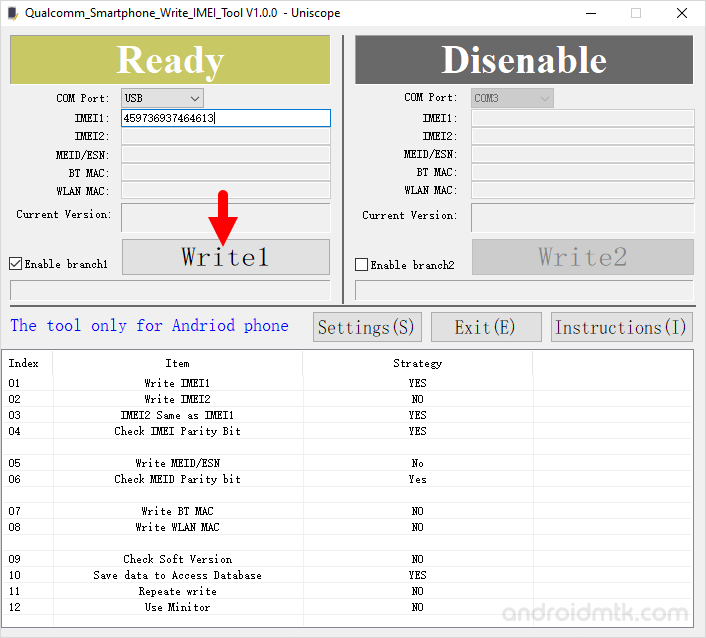 [*] Uniscope Driver: We recommend you to use the Original Uniscope Driver with the Uniscope Qualcomm IMEI Tool. You can download it from here. 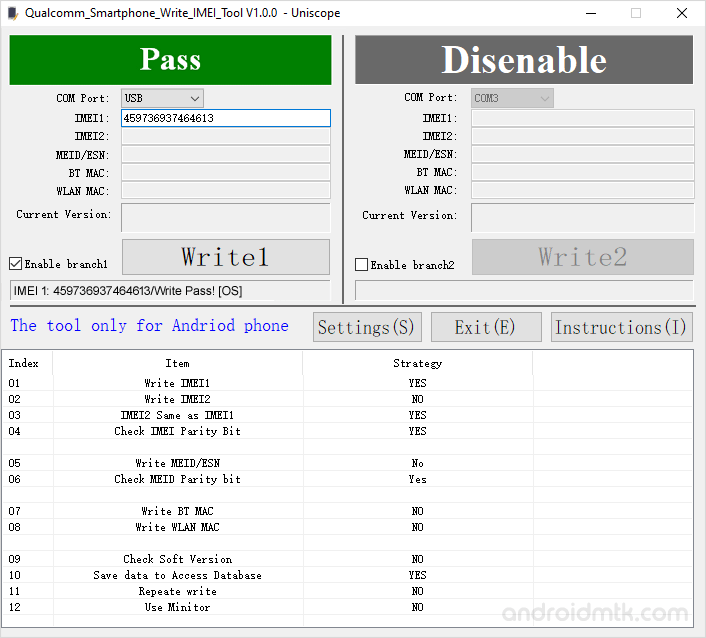 [*] Credits: Uniscope Qualcomm Write IMEI Tool is created and distributed by Uniscope Inc. So, full credits goes to them for sharing the application for free.